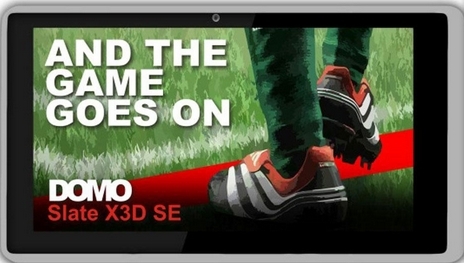 DOMO SLATE X3D SE GAMING TABLET has a visibly smooth and superior multi touch flow interface. It come with 7-inch (diagonal) LCD backlit glossy widescreen display and powered by a 1.2GHz Cortex A9 Dual Core processor, Mali 400 Graphics processor for 3D gaming and 1 GB DDR 3 high speed RAM memory. 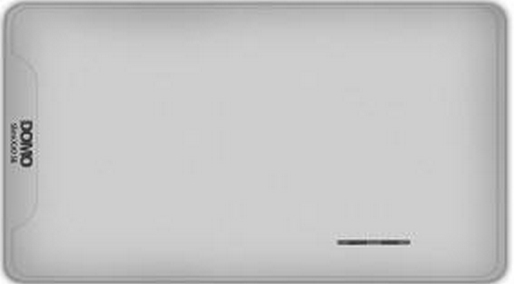 The Tablet runs on Android 4.0.3 Ice Cream Sandwich operating system. It has 4 GB internal memory, Expandable memory up to 32 GB using Micro SD memory card. DOMO SLATE X3D SE has built-in 3000 MAH rechargeable lithium polymer battery, it give battery back-up up to 2-5 hours of surfing the web on Wi-Fi, watching video, or listening to music. It has an internal front facing camera for video chatting. It supports 3G Dongles-WCDMA. Adobe flash player enabled in SLATE X3D SE. It has a media player. Media player support HE-AAC, AAC MP3, WAV, OGG APE, FLAC, AC3 and WMA audio files and H.264, MPEG-4 video, AVI video, RM, RMVB, MKV, FLV, MPG, MP4, 3GP, DAT, MOV video files. Also you can connect it to your TV with TV out cable up to 1080 Pixel. It enabled Wi-Fi, LAN, 3G and GPS. Portable Hotspot makes your device a Wi-Fi Router.